170 Scarboro Creek Drive, Manteo, NC.| MLS# 102613 | Outer Banks Homes For Sale, North Carolina Home Search Including Nags Head, Pirates Cove, Manteo, Kill Devil Hills Kitty Hawk, Southern Shores, Duck, and Corolla North Carolina, Oceanfront and Soundfront properties for sale and long term rentals. Imagine walking out to 100 feet of boat dock with 6000 lb. capacity boat lift to your own boat with direct access to Shallowbag Bay, Roanoke Sound, and beyond. Home is perfect for outside living with hot tub and 872 square feet of deck, screen porch, and game room on first floor. 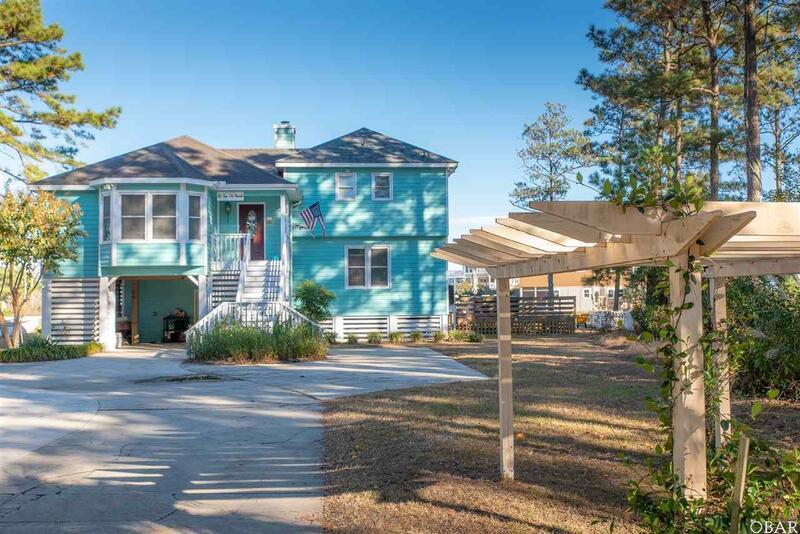 The house has 3 bedrooms, large master with sunroom/study with awesome views of the Roanoke Sound, large master bath, walk in closet, 2 other bedrooms on separate level with bath. Nice size living room with built ins and gas fireplace is open to dining area. Hardwoods in living area, hallway and master. Tile in baths, slate in kitchen and foyer. Although neighborhood is residential with HOA and covenants property is zoned industrial by Dare County. Call for Copy.